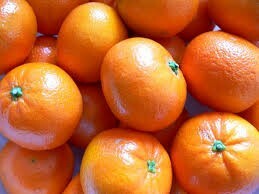 Similar to the Tangerine the Clementine is a small glossy variety of Mandarin. Incredibly juicy and sweet the Clementine contains less citric acid than other oranges giving it its softer sweeter taste. Usually seedless the Clementine is sometimes referred to as a seedless tangerine. This potential to be seedless makes it ideal for use in fruit salads or as a topping on a fruit tart.